In Riviera Nayarit luxury means magic, and Bucerías will embrace this very magic on January 23 – 25 at its Street Festival. The festival will include the Chalk Walk, the Taste of Riviera Nayarit and the Handcrafts Fair – three simultaneous events for the enjoyment of all visitors. 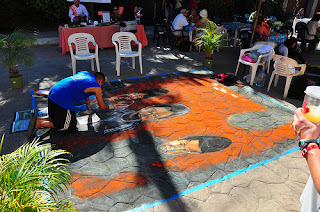 Four years ago, The Art Walk Plaza, an organization dedicated to the promotion of culture in Bucerías, organized the Chalk Festival for the first time – known today as The Bucerías Chalk Art Walk – a competition that assembles Mexican and international chalk artists, who create their work on the streets. In 2013, artists will compete to obtain the top awards with chalk art designs inspired by Mexican cuisine. There’ll also be chalk-drawing workshops for 150 children in Bucerías on Friday 25. It’s important to mention that during the three days of the event, the Lazaro Cardenas Street, which runs parallel to the beach in the Zona Dorada area of Bucerias, will be closed to traffic between the streets of Benito Juárez and Galeana, as there will be stands setup for restaurants and for people selling handcrafts, while artists create their designs on the pavement. What are the dates for the festival January 2014? We have not a confirmation yet but it would be most likely 22-24. When is the festival in Bucerias in January and how long does it run? Buenos días, aun se realiza ese Festival? habrá este enero que viene? Me gustaría saber como participar. Hola Andy, me parece que éste año ya no se realizará el evento. El último fue en 2013.